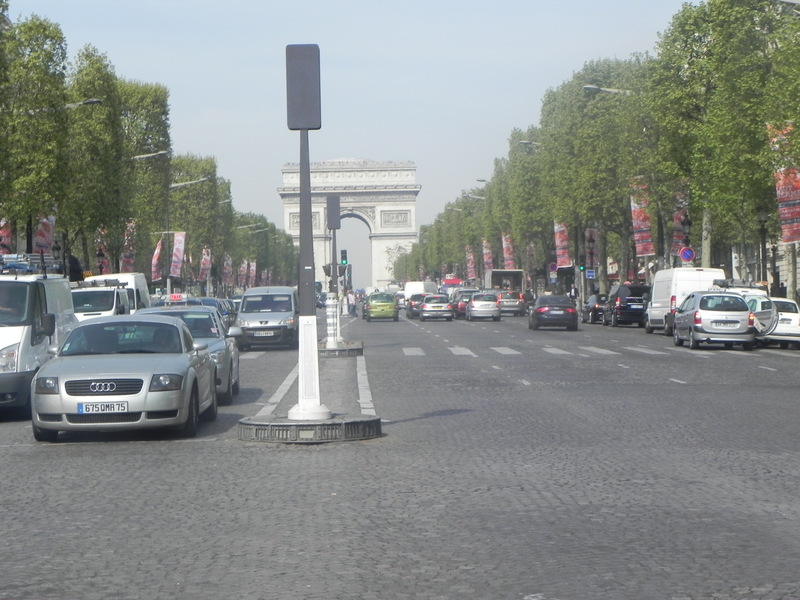 The Experienced Travelers confess that the vast Champs-Élysées is not a favorite destination in Paris. But despite our personal preferences, we felt we owed it to the dear Readership to investigate the legendary avenue. This way you are fully informed when you loiter there on a café terrace and spend twice as much money for the dubious pleasure of doing so. There. Have we made our feelings known? 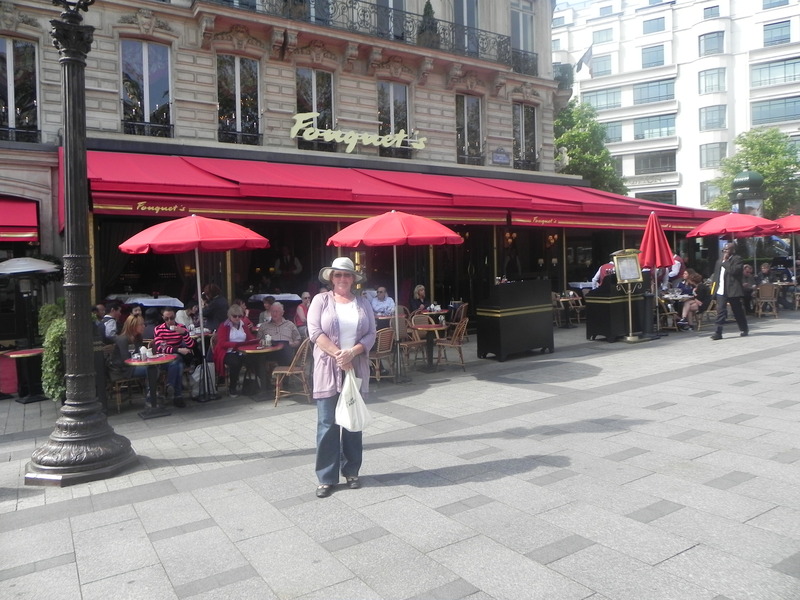 Melinda outside Restaurant Fouquet, where 30 euro buys you a smoked salmon starter and you can rub elbows with the elite. Fouquet is an historical monument. Extending 1.8 miles from the Place de la Concorde to the Place Charles de Gaulle, the Champs-Élysées begins peacefully with lovely gardens. Then just beyond the Grand Palais, it bursts into the frenzied madness that gives the ETs a case of vertigo. 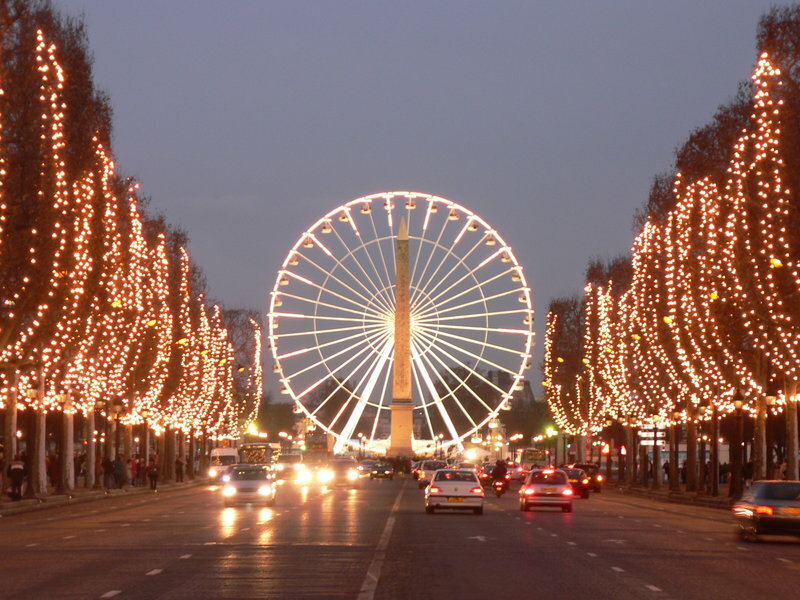 But the Champs-Élysées has it’s fans and you may well become one of them if you have energy to spare and a penchant for shopping and clubbing. A walk down the avenue lit by fairy lights for Christmas might soften the ETs feelings. Or maybe we should wake early to catch a morning vista that highlights the Historical Axis, a miracle of urban planning with the perfect alignment of the Petit Carrousel, Tuilleries gardens, Luxor Obelisk, Arc de Triomphe and La Grande Arch at La Défense. 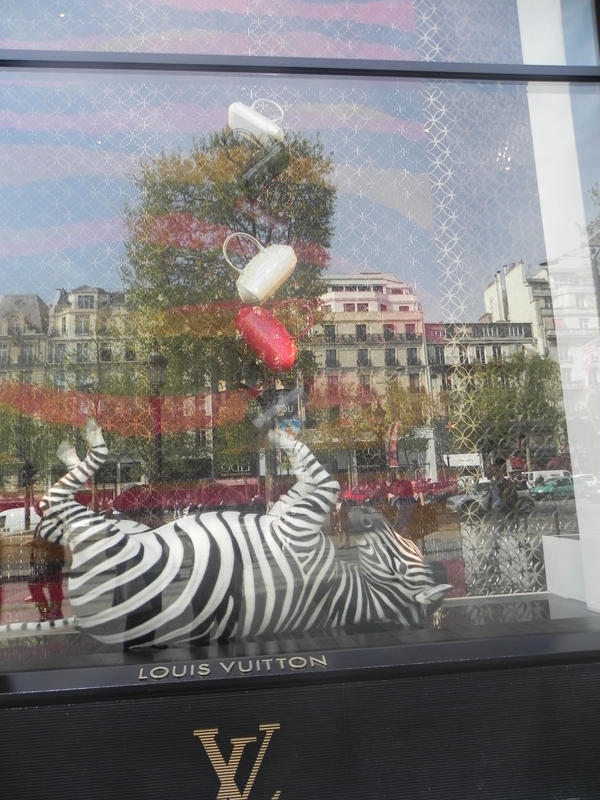 I recently read an article that described the Champs-Élysées as a the urban equivalent of an airport duty-free mall. (I wish I could remember where I read that…). Several high-end stores are there – Cartier, Hugo Boss, Louis Vuitton – but so is Disney, Gap and Nike. We suppose it’s an egalitarian mix, but the French government is taking steps to limit the encroachment of chain-style retail in an effort to restore the old girl’s reputation. 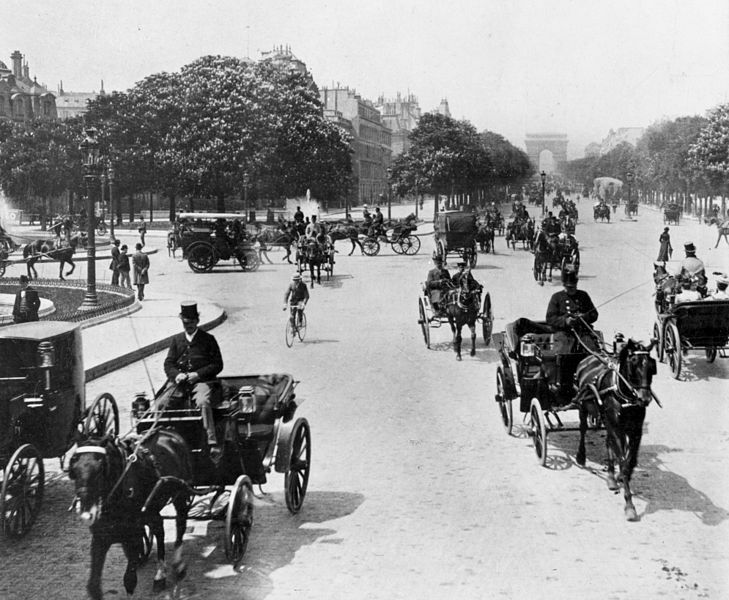 See and be seen in 1903 on the Avenue des Champs-Élysées. A relatively quiet moment at the Place de l’Étoile. Buckle up and prepare for a crazy ride. Barbara and Christine took this picture on our last visit. 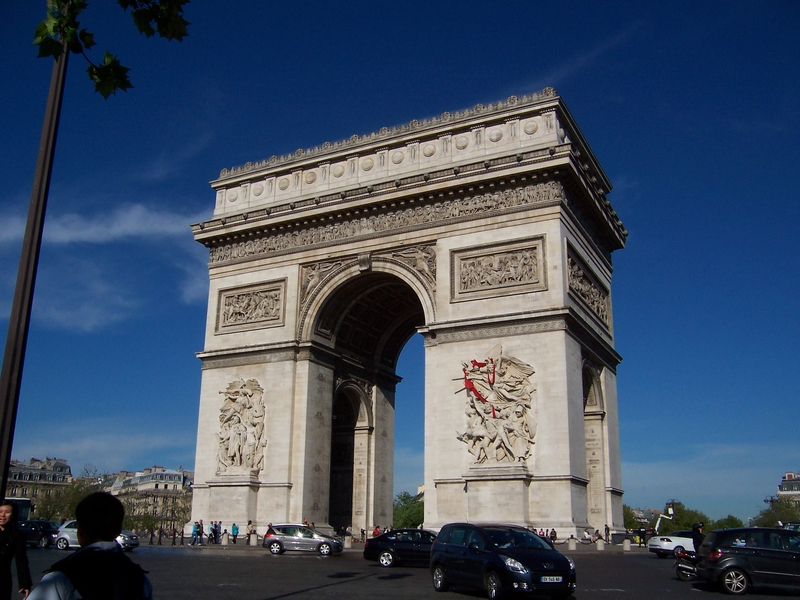 Napoleon commissioned the crowning glory of the avenue, the magnificent Arc de Triomphe. 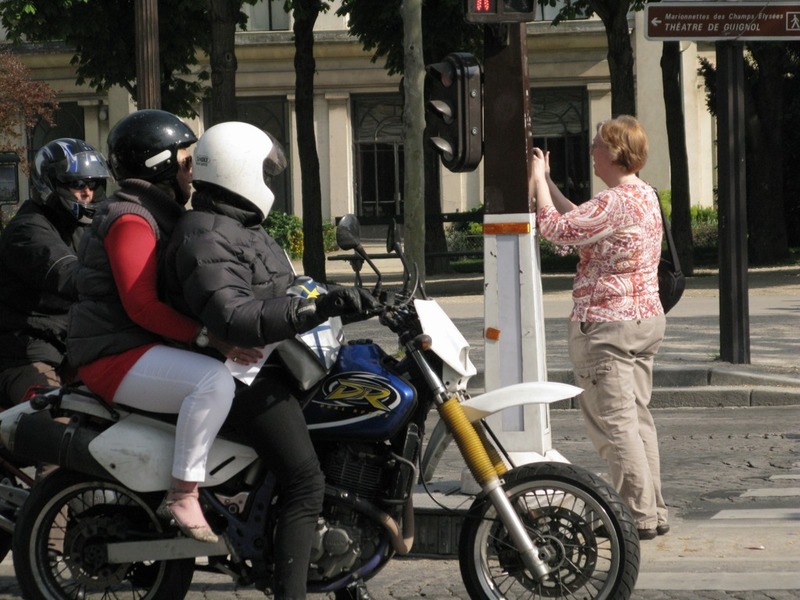 It now serves as a giant traffic roundabout that Parisian drivers regard as a eight-lane NASCAR track. On a clear day, the trip to the top is rewarded by the excellent view. In the dark days of the Occcupation, the Nazis staged regular military parades. Four years later, the Free French and Liberation forces took back the avenue with triumphant marches of their own. Now, Bastille Day celebrations on the Champs-Élysées are a riotous time and a legitimate reason for champagne before noon. Risking personal safety for the sake of a photo. It only took one valium to prepare me for my mission. Today the triumphant marches down the avenue are Manolo Blahnik-shod troops of shoppers liberating handbags, clothing and glittering bling from locked display cases in stores. If your exchange rate against the euro is better than our dollar, you can help free France from the daunting European financial crisis. Do your part and shop for the good of la belle France! 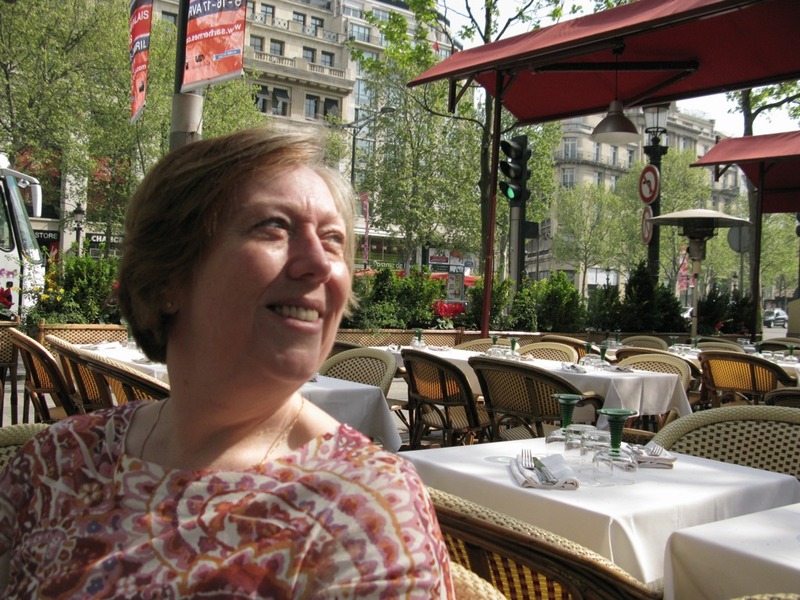 Resting at the Cafe Roma. Would Mme. de Pompadour care to join me?